Kevin Schiltz has worked with Operation Mobilization since 2009 starting with student ministries in Lebanon. Operation Mobilization’s mission is to see vibrant communities of Christ-followers among the least reached. After getting married to Amy, the Schiltzes decided to remain in the Arab world and follow God’s calling together as a couple. Since 2015, the Schiltz family has been in Jordan witnessing and ministering to Muslims with the gospel of Jesus Christ. They have added three daughters to their family and added another missionary family to their team. Kevin operates a fully-functional rooftop aquaponics demonstration farm which helps the missionaries gain access to communities, builds trust and maintains a way in which to stay in the country. 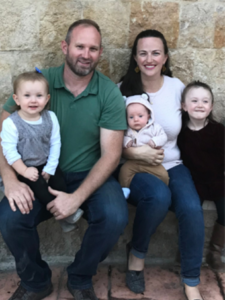 Kevin also co-leads a weekly small group Bible study of six Muslim-background believers and is part of a leadership council that oversees the work of OM teams in Lebanon, Iraq, and Jordan. The Schiltz family seeks relationships everywhere they can to glorify God in their witness. Sometimes that means ongoing relationships with the hotel staff where the greenhouse is located, with neighbors, and sometimes it means one-time conversations with taxi drivers and people on the street. Click the link for more information on Operation Mobilization. Click here to view the Schiltz family’s latest newsletter and to read previous posts.